How many women in Africa have a mobile financial account? What is the difference between rural and urban women’s mobile phone ownership rate in Mexico? How much less likely are women than men to have used a mobile financial account in the last 12 months? These are some of the questions that research and data are now able to answer. 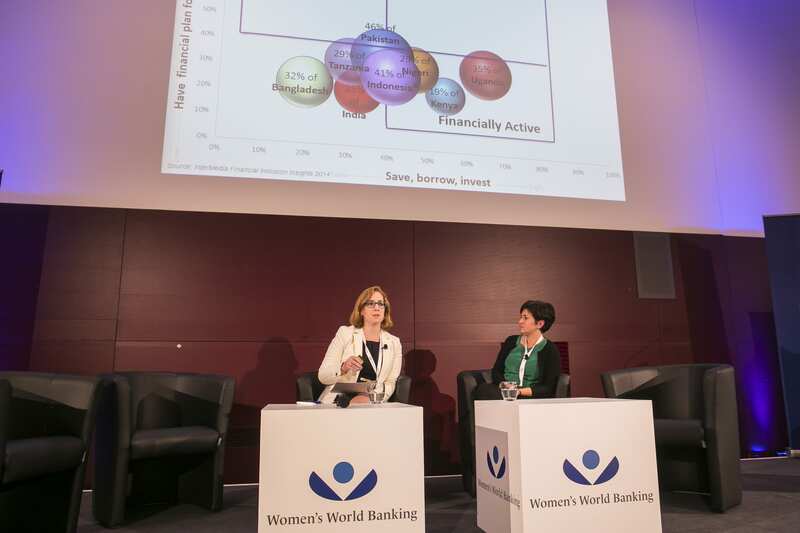 Colleen Learch from InterMedia and Claire Sibthorpe from the GSMA presented their latest research about women and mobile financial inclusion in a panel discussion at Women’s World Banking’s Making Finance Work for Women Summit in Berlin this past November. While international collection of gender-disaggregated financial inclusion data has greatly increased in the past several years and enabled more refined analysis, gaps in our understanding of the different ways men and women use technology still exist. However, Claire and Colleen chose to focus their discussion less on these remaining information challenges and more on the many ways mobile innovations can help close the gender gap in women’s financial inclusion. To refocus our thinking towards opportunities, we must first know how to find them. Here is where data can be incredibly valuable: context matters, and understanding where, how and which segments of women are excluded from financial services is key. In order to target the greatest opportunities for financial inclusion, we need more information about the gender gaps in financial accounts, mobile accounts and mobile usage. The latest analysis shows variation within both regions and countries as it relates to mobile phone access. For instance, a gender gap of 13% exists between men and women in ownership of mobile phones across Africa, but this regional average comprises a wide range of differences between countries. In Kenya, where M-Pesa mobile accounts have high market penetration, women lag by only 7% mobile phone ownership, while in Niger they lag by 45% mobile phone ownership. There are also substantial variations within countries: in Mexico, there is only a 2% gender gap in access to mobile phones in urban areas, but a 26% gap in rural areas. It’s important to understand the context of mobile phone ownership, since successful implementation of digital financial services will depend on access and use of a mobile phone. By using such data to inform action, policy makers, financial service providers, and development organizations can more effectively advance women’s financial inclusion. Research has shown that women are financially active and often make financial decisions for an entire household. Women’s World Banking found, for instance, that low-income women save on average 10 to 15 percent of their earnings. In other words, women have the desire and knowledge to manage their finances but face unique barriers in accessing appropriate financial products and services, including mobile tools. Challenges related to cost, security (e.g., phone theft, harassment, or fraud) and technical literacy are more acute for women, given social norms and structural inequalities. Larger issues of inclusion that disproportionately affect women, such as lack of identification documents, can also limit their ability to access the formal financial system. In order to seize the opportunities to close these gender gaps, greater understanding of women’s usage patterns is needed. More research and data collection can be done to identify, for example, where women are located or what specific product features or delivery mechanisms can reduce barriers to women’s financial inclusion. While mobile financial services have helped reach more than 700,000 new account owners in recent years, the gender gap in financial access remains stuck at 9% and over 1 billion women are still unbanked. By focusing on data-driven opportunities, the global community can close these gaps and reap the economic and social benefits of women’s financial inclusion. Want more on women and mobile? Check out the full session video here.